Developing next-generation technologies to restore memory is the goal of a new, multi-center $22.5 million, four-year effort. The project, which is in support of President Obama’s BRAIN (Brain Research through Advancing Innovative Neurotechnologies) initiative, will combine research on the basic mechanisms of memory function with the development of systems designed to electrically stimulate discrete regions of the brain. University of Washington researchers are playing a key role in this effort to help those with memory loss. The UW component is led by Dr. Elizabeth Buffalo, associate professor of physiology and biophysics and core faculty of the Washington National Primate Research Center, in collaboration with Dr. Jeffrey Ojemann, UW professor of neurological surgery, and Dr. Nathan Kutz, UW professor and chair of applied mathematics. 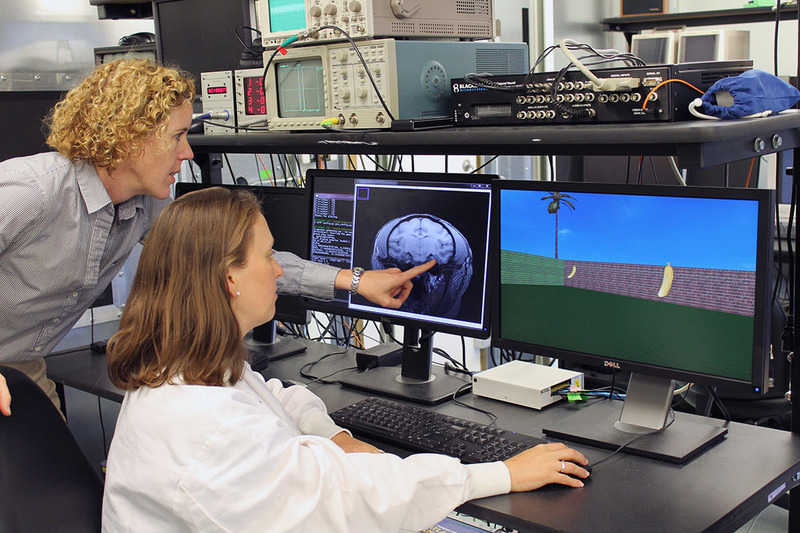 The national initiative, led by Dr. Michael Kahana, professor of psychology at the University of Pennsylvania, is part of the “Restoring Active Memory” program sponsored by the Defense Advanced Research Projects Agency, or DARPA. Because memory is the result of complex interactions between widespread brain regions, the researchers will study neurosurgical patients who already have electrodes implanted in various areas of their brains for the treatment of neurological disease. By recording neural activity from these electrodes as patients play memory games, the researchers will measure biomarkers of successful memory function. They are looking for patterns of brain activity that accompany the successful formation of new memories and the successful retrieval of old ones. “Our goal is to identify patterns of neural activity that are associated with optimal memory function and then recreate those activity patterns through brain stimulation in order to restore normal function in patients with memory disorders,” said Buffalo. Solving this problem will involve recruiting neurosurgical patients with epilepsy and Parkinson’s disease, who ordinarily receive brain stimulation as part of their clinical treatment. These patients may elect to participate in the project’s research studies, which entail receiving safe levels of brain stimulation as they play memory games. The research will help determine if their memory can be improved by these interventions. Similar studies will be carried out at the Washington National Primate Research Center to refine optimal stimulation targets and protocols. Patients will be recruited at the University of Washington Medical Center along with six other major medical centers: the Hospital of the University of Pennsylvania, Thomas Jefferson University Hospital, Dartmouth-Hitchcock Medical Center, Emory University Hospital, the Mayo Clinic and the National Institutes of Health Clinical Center. Neuroscientists, engineers and applied mathematicians from the University of Washington, Boston University, and Drexel University will work on computational models of memory and algorithms to guide brain stimulation. This system may lead to better understanding of the brain and how deep brain stimulation therapy can potentially restore normal brain function following injury or the onset of neuropsychological illness. Neuropace, whose RNS® System was FDA-approved in November to reduce the frequency of seizures in epilepsy patients who have not responded well to medications, will join the project to provide another platform for research in patients with implanted electrodes.By its completion, the project aims to lay the groundwork for a fully implantable neural monitoring and stimulation system that could be used in the treatment of memory loss.